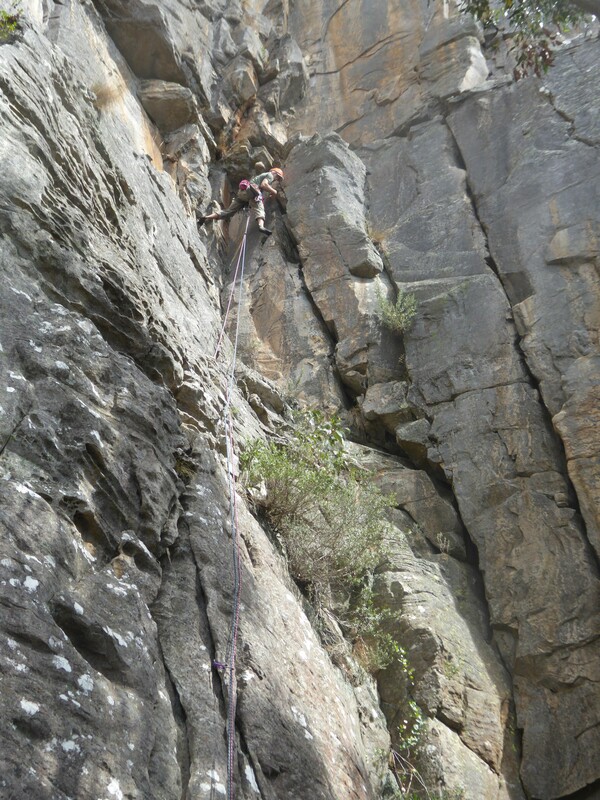 Mt Rosea is one of the classic trad cliffs of Victorian climbing. With a vertical height of between 90 and 120 metres, most climbs require from 3 to 5 pitches, even with 60 metre ropes. The cliff has a uniform steepness that makes climbs quite sustained and there are no really easy climbs here; there is no Tiptoe Ridge or Spiral Staircase. You need to be comfortable leading grade 12-13 and the cliff really shines for those climbing between grades 16-22. In the terms of VCC Club Trips, you need to be an Advanced Climber. The focus of the trip is to introduce people who haven’t climbed at Rosea before, or who have done a little but found it intimidating. More experienced climbers can spread their wings a bit in the more relaxed atmosphere you get when there’s a group of people to relieve the isolation. Everyone should get up a multi-pitch climb on each day, weather-permitting, and there are some good single or two-pitch options to help round out the day. Rosea will test your route-finding. You don’t get the opportunity to view the cliff in full and pick out your line against a photo. You arrive at the base of the cliff and can only clearly see the first 40 metres or so before fore-shortening collapses the features. You should come away from the weekend with a healthy respect for the cliff but confident that you are capable to explore it further yourself. Please contact Kieran, the Trip Leader, for more details and to secure your place on this trip. Photo: Matt Johnston climbing Debutante (15). Not sure if you’re novice, intermediate or advanced? Find your level or contact the trip leader.